When setting up for your outdoor space, don't forget about needing Lights For your Umbrella. Different styles are available, clamp type for the post, table top, built into the ribs of the umbrella and clip-on for the ribs of the umbrella. Table tops are just regular lamps and we will not look at these in this post. Post style of lights will have a method to clamp the light at a level that you find the best light for your situation. Most post style lights can be installed with the lights up or down, depending on the mood or light you need. The lights that fit on the ribs of the umbrella will stationary and you will not be able to adjust the lights.The rib lights will cover a larger area normally under ideal conditions. In these lights, different types of power sources will be used. Some will work off of regular 110 volt house current, you will need to plug into a grounded outlet and use the proper outdoor extension cord for power. Solar panels with rechargeable batteries are another source for you choice of power. Low Voltage style will be for a more permanent installation. How far you are from a power source will determine what types of power source that will work in your outdoor space. This light will clamp to at any height on the umbrella pole, as long as it does not interfere with the tilt of the umbrella. This rechargeable light comes in two sizes to match the amount of light you will need, a four pod and a six pod. Each pod will have 6 LED lights in them. If you have a cantilever umbrella you can mount on the middle down rod. The power will come from three 4.2 volt AA rechargeable Nickel Metal-Hydride batteries. A power cord from the charger will plug into the batteries for recharge. Must use charger supplied to recharge batteries, Lights will not work while charging. The batteries will last around 6 hours. Batteries can be replaced when they no longer hold a charge. This type of light can be used a great distance form a power source, as you can take the unit off of the umbrella and bring it into the house to recharge. This light can be moved to different umbrella's so you only have to purchase one to cover multiple locations unless you need to light all of them at the same time. 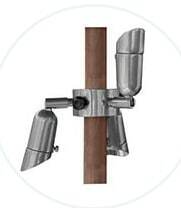 This three light fixture will mount on any pole up to 1 3/4 inches and can be mounted in damp locations. It will come in 15 different finishes to match any decor. The three lights are adjustable to point in any direction. 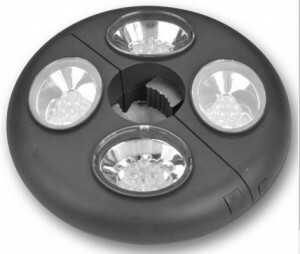 The three lights are powered by a 10 watt MR8 12 volt low voltage bulbs. You will have to supply a transformer to power this light. Light comes with a 12 foot 18-2 gauge power cord to connect to the transformer. No connector included. 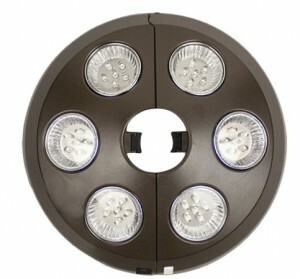 This four pod light will have seven LED bulbs per pod. It will attach easily to any pole up to 2 inches in diameter. Can be pointed down for table illumination or up for a more diffused light. Power will come from four AA batteries or you can use an adapter for power. No Batteries or Power adapter included. It is 8 inches in diameter and 2.25 inches tall. This string type of light will mount on the bottom of the eight ribs of your umbrella. Attaches to umbrella ribs with clips and zip ties. Can be a little trouble with installation as you have several steps that require some fiddling. The good news it can be left on umbrella when closed. It is powered by regular 110 volt house current, must be plugged into a ground fault circuit. It has a three foot power cord that will plug into a multi plug power cord that is supplied, this will let you plug in two other electric items. The eight light strips connect to the power cord with an adapter. If you are looking for an all in one umbrella and light set this will work for you. This is a 9 foot umbrella with a top vent that comes in three colors (brown, cream and wine red). It has a push button tilt feature and does not come with a base or insert for the hole in the table. Visit this post for base suggestions. Frame of the umbrella is black aluminum with a polyester fabric cover for UV protection. There are three LED lights on each of the eight ribs. The on/off switch is on the pole near the tilt pivot point. 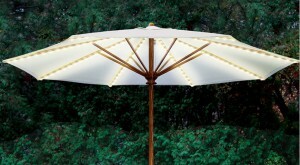 A solar panel located on the top of the umbrella charges the two batteries for light after dark. This light set on this umbrella is only solar powered. The umbrella is 9 feet in diameter and 7 foot 9 inches tall. 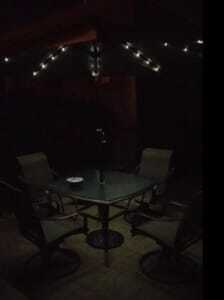 Several styles of solar powered lights are available for your patio umbrella. 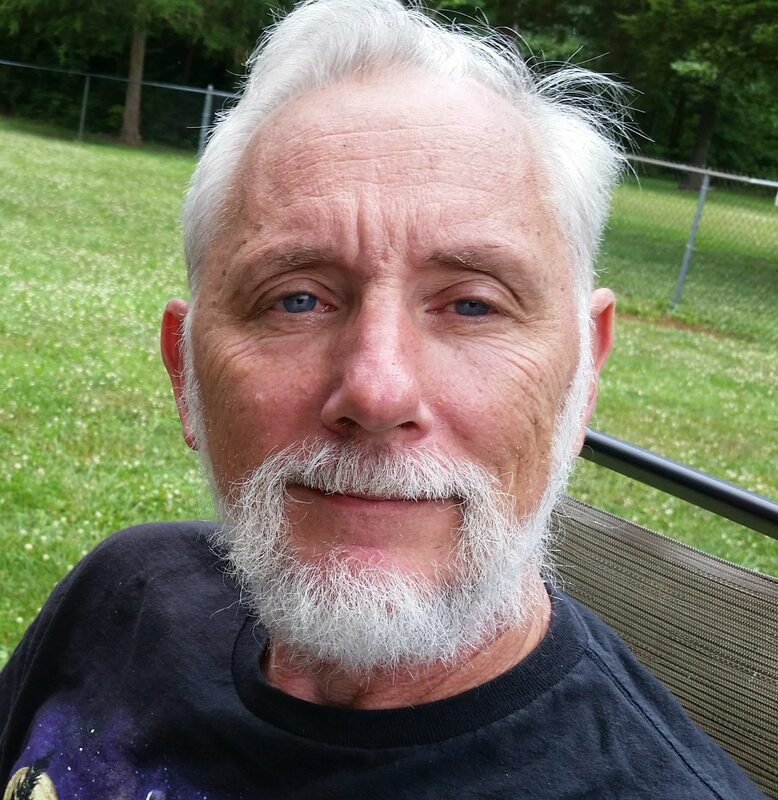 I have a post with several options, you can follow this link to see if one will work for you. With the information provided I hope that your decision on what kind of light will work best for you will be easier. If you are planning a barbecue, camping, night out or card playing, one of these will provide the proper lighting for you. Just pay attention to the power source requirements of each light. Interesting article about outdoor lighting systems. I never even thought there were so many different options. One question though : What about solar power to recharge the lights ? Is it not a good alternative to recharge the batteries, in stead of the trouble to run a cable every time to recharge ? Thanks for sharing your ideas with me. Much appreciated. The set that does come with the recharge cord does not have a solar option. A person with a little fiddling could set up a simple solar system to recharge the batteries if in a remote location. This is such a great idea for outdoor barbecues and special parties. The lights on the umbrella offer an extra sense of an upscale type party. I really enjoyed the rib lights although I am wary or the extra installment time the fact that you can leave them on it such a big plus Are there any lights like these that could work with solar power? thanks! As most of these lights are made to stay on the umbrella, you could convert the low voltage to solar powered with a remote solar panel and rechargeable batteries. There are several kits on the market for this. I am very glad to read such article. I already knew some light types you mentioned, but Was amazed by the led lights inside the umbrellas, specially the one solar powered. I would be more than happy if you choose to advice us a place where to buy such items. As some of my items I write about do not have a Affiliate in my area, I only give information on some items. If you do a search on the items I have written about you will find a vendor in your area. Hi John, you have a wide variety of lighting fixtures outdoors. What I like is safety features you have included in the post like the tripping on obstacles and the recommended location of tranformers for low voltage lighting. For this type of project, do you provide services for the installation in your area? including the wire run and location of transformers? or do you provide recommended wiring layout? I can help you with your layout if you have a detailed map of the area in which you are going to illuminate. You send me your lay out and I will return it with my recommendations. At this time I am out of the installation part of Low Voltage Lighting for your Outdoor areas. Thanks John, I will keep that for my future project. Thanks a lot for your reply.